I saw this thread and thought it was important to share this bit of information. 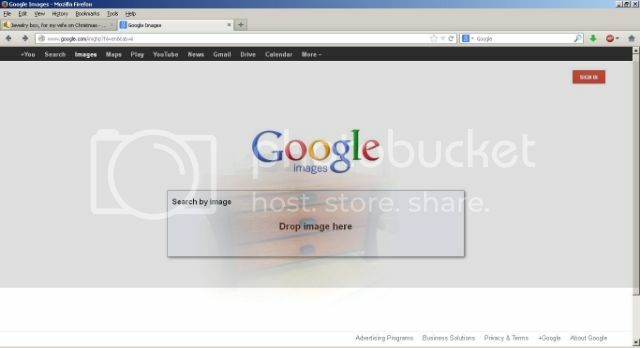 You can now use Google image search to reverse look up an image to see where it has been posted. If anyone has copied any of your images that you’ve included on your projects or blog posts and posted them elsewhere, you can see it using this simple method. 1) Open up one of your project pages, and also open a tab running Google image search. Click any image of your project and drag it towards the tab running the Google image search. You might see a “ghost” of the image follow your cursor like you see here. 2) The tab should switch over automatically to the Google image search. Then keep dragging the image and let go on top of the search bar where you would normally type some text. Now hit the search button. 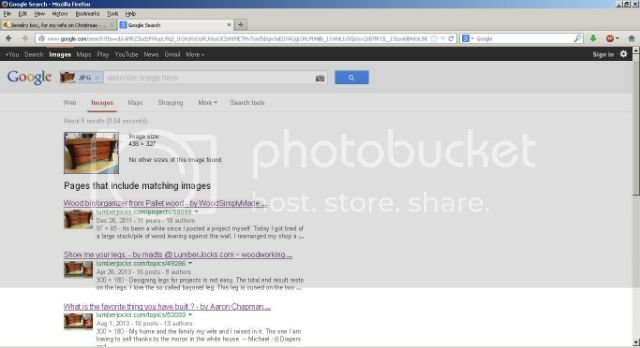 3) The image search will now show you any pages where your image has been used, shared, possibly stolen, shared without credit, etc. I have no idea what could legally be done if your work has been uncredited or passed off as someone else’s. But at least there’s the satisfaction of calling someone on their BS. Or it could be that your project(s) found its way onto some random blog and someone just thought it was cool, and they might be happy to credit you as the creator. Now you know, and knowing’s half the battle. For Firefox and Chrome users, there is also a free plug-in. When installed, the user can simply right click on an image and search Google, Tineye, and others for additional instances. Very good info, Brian. Don’t think I have to worry about my projects, but some of the more talented LJ’s might. Thanks for the information. As far as doing anything about misappropriation of one’s work, there is not much that can be done if that work was not copyrighted before being introduced into the public domain. So, you are right on about satisfaction being from calling BS on uncredited use. Easy enough to put a watermark on your photo’s using any of a number of software programs. There’s not a lot you can do legally. You can complain to the site owner or his web hosting service. 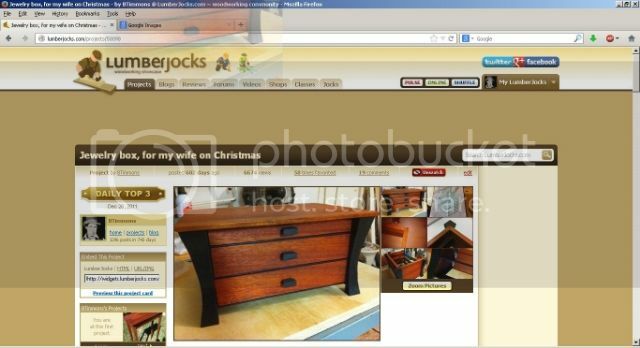 If you’re pic is on eBay and you see your image on another listing you can get eBay to take down their listing. Webmasters have long had some sneaky tricks to pull on other websites that use their images from their hosting. I’ve even done it, myself. You just change the filename of the original image shown on your site, then upload some other odd image and give it the old filename. This puts a new image of your choice on their website in place of the one they stole. I just used a graphic with text I made that says “this image originated from www.mysite.com”. Some webmasters have been less kind, though, sending them all manner of atrocious imagery. You’re right BARRY, if anyone is interested, it’s called “Who stole my picture”. I have it on my computer and find it comes in handy. The Family workshop have been trough this a few times, so we have trademarked and copyrighted Our drawings and Products. As a hobby or smal producer thats far to expensive to be usefull. But still a watermark could at least prove that you produced it first. Its happened many times trough the years that i have been to exibitions and come upon someone producing and selling Things made from my fathers or grandfathers designs, they usualy get pretty ashamed if confronted With it. Most at least, some People is without shame. Nice and informative post. Some Things i just cant post here on lumberjocks, since i have customer confidiality on many Projects, and are only alowed to show it to potencial customer and similar, so even if i could show it here, on lumberjocks it could get copied by a journalist or something and get to the papers, witch would be wery bad both for my customer and me. I have encountered some sites that have protection on pics so you cant copy them, but how Advanced that is and how mutch work it is i dont know.